We’ve been lucky enough to have the walls of our office adorned with some beautiful artwork. 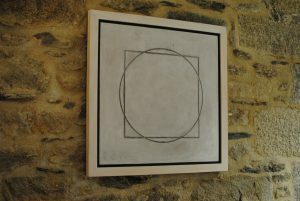 Up at the moment are a selection of pieces by Cornish artist Joe Morris. Joe’s work is both ancient and contemporary, drawing upon pre-history to explore not only the first origins of art but also what it really means to be an artist today. His minimalist compositions resonate with something much deeper in all of us, and the bold, universal simplicity of Joe’s visual language – alongside the dynamic process behind the work – ensure his artworks are highly sought after. The underlying patterns and symmetries of Britain’s remote, wild landscapes help to provide Joe with an endless source of inspiration; particularly the natural “rhythms” of the seasons, the archaeological traces of ancient cultures, or even the wires and highways of the modern world, which occasionally slice through. A sense of the artist as ‘conduit’ – somehow making the unseen visible, and connecting us to a deeper, shared experience – gently emanates throughout all of Joe’s artworks. It’s no surprise that music is also a constant inspiration, and Joe uses it to accompany what is an incredibly time-consuming, yet satisfying, creative process which becomes ultimately, in his words, “a positive meditation on every aspect of my world”. 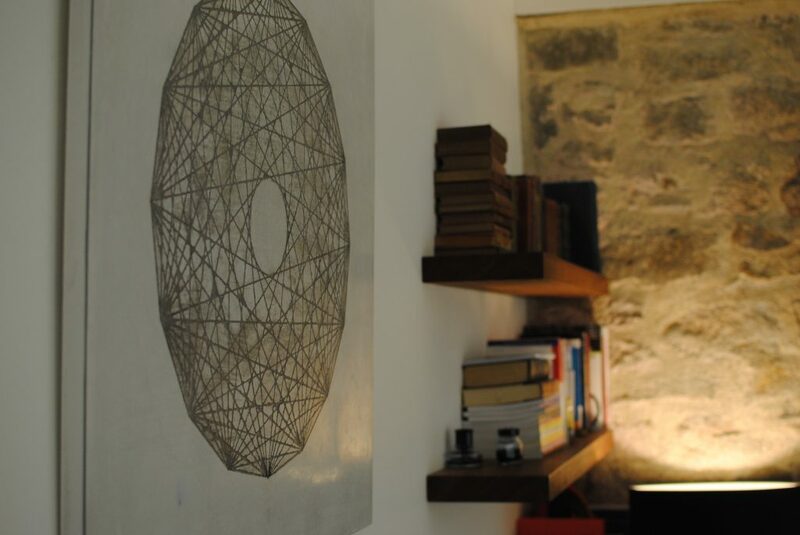 ‘Universal Geometries’ are also a strong influence, and Joe’s choice of Tadelakt as an artistic medium – drawing or carving patterns into the material with simple tools, then finely polishing it into stone-like surface by hand – results in an engaging, tactile appeal to each unique piece. Joe first discovered Tadelakt when he helped to restore a historic Cornish manor house, and he was immediately drawn to the idea of using it artistically. In his hands, the material becomes something completely new and, by exploring it’s creative possibilities, he has successfully developed his own singular visual language through which to create a much-needed space for contemplation, stillness and quiet. As well as being in The Peloton office, Joe’s work was selected and specially commissioned for James and Mary St Levan, in collaboaration with Art Eye and 3iDog Interior Design, for the Sail Loft Restaurant, St Michael’s Mount. It also adorns the entrance of the Goldolphin Arms Hotel, Marazion, opposite the mount.